West-Himalayan Silver Fir is a slender pyramidal tree which can grow up to 50 m tall, but generally smaller. Upper branches are horizontal and branchlets horizontal and flattened. Bark is longitudinally deeply grooved. It is distinguished by the branchlets which are hairless in the grooves, and by the leaves borne on the upper part of the branchlets, erect or directed forward, loosely overlapping. Tips of the leaves have two sharp tapering points. Leaves are 4-7 cm long, shining dark green above, with two faint silvery line beneath. 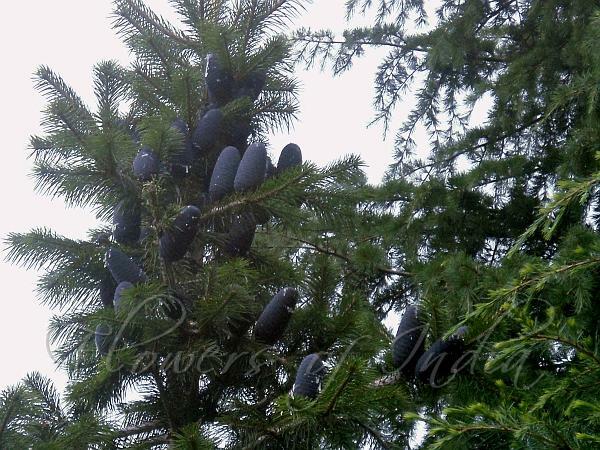 Cones are dark purple, erect, cylindrical, 10-20 cm long, 4-7.5 cm in diameter. 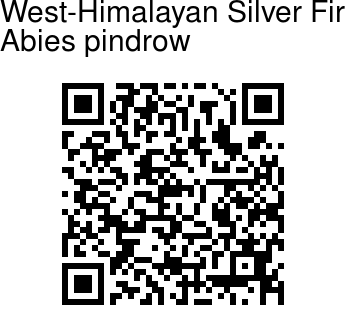 West-Himalayan Silver Fir is found in the Himalayas, from Afghanistan to W. Nepal, at altitudes of 2100-3600 m. Flowering: April-May.